The Church of The Ascension would like to cordially welcome all of our visitors and newcomers today. We are so glad that you have chosen to worship with us. Please visit our website at: ascensionrvc.orgto learn more about our parish. 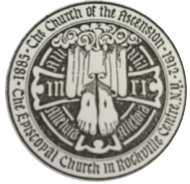 If you would like to be added to our mailing list, please email our parish administrator at:parishadmin@ascensionrvc.org. Follow us on Facebook as well! Following the 10:30 am Easter Day Mass, there will be a festive coffee-hour reception in the Parish Hall. All are invited to attend. There will be no 5 pm Saturday evening service next week. There will be no Sunday School today, Easter Sunday and on Sunday, April 28th. All kids should go to church. Interested in joining a CSA? A CSA is a way to purchase a weekly allotment of fresh vegetables from a local organic farm. Members buy a share in the Spring, and during the growing season (mid-June to October) an assortment of vegetables are delivered to the church to be picked up by the members. The cost of a share is $550 for the full season of vegetables. Extra or unwanted vegetables are donated to the Mary Brenan INN. Please let Fr. Kevin know if you are interested. We need about 10 shares in order for our church to be a pickup site. Our next Children’s Prayer Breakfast will be held on Sunday, May 5th at 9:30 am. The Museum of Rockville Centre will host a one-day Antiques Appraisal event. It will be held on Sunday, May 5th, from 1 PM to 4 PM, at the Phillips House, 28 Hempstead Avenue (a few blocks north of Ascension). Bring your antiques and antique suspects to have them appraised by Antiques Road Show expert Philip Weiss. The cost is 3 appraisals for $25 which includes a membership to the museum or $10 per item. All proceeds benefit the Museum. Refreshments will be served. Questions?? Please speak with Frank Seipp at (516) 764-7459. “The William Rosencrans Honors Recital” featuring OUR Courtney Cox, sorprano, will be held at The Fortunoff Theater, Monroe Lecture Hall, at Hofstra University. This church & choir has been so blessed to have Courtney as our fearless Alto section leader. She has changed the dynamics and confidence of the alto section by her leadership. We now appear to learn new pieces more quickly– she’s that good. It’s like magic. Ya gotta love a gal that knows her notes. I encourage you all to come and support Courtney in her last Senior Recital. You will have an afternoon of relaxing pleasure. OH!!!!!!! AND IT’S FREE! The parish office will be staffed on Monday and Wednesday from 9 am to 2 pm. At other times please leave a voice mail message which will be returned. Or you may send an email to parishadmin@ascensionrvc.org. Material for the Sunday bulletin is due by Monday at noon.